First get your kids into classes here at Tai-Kai. Kids should pick their friends wisely, and should gather their support. Bullies can be stopped. We all have to do our part. Come in and try a FREE kid’s class here. 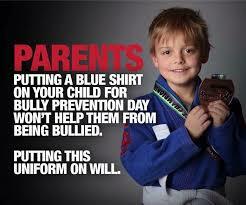 We teach so much self confidence and self defense that your child will not be bullied.